There was an article in the paper the other day about how the Pentagon was being asked to explain a recent purchase. They had purchased new uniforms for the Afghan Army at a cost of $28 million. A major problem is, the uniforms have a proprietary forest camouflage scheme on them while Afghanistan is 98% desert and woodlands only cover 2% of the terrain. The U.S. Inspector General criticized the purchase in June and has begun criminal proceedings. Senator McCaskill, of the Senate Homeland Security and Government Affairs Committee, wants answers and the House Armed Services Committee is investigating. The Pentagon admits it has spent $93 million since 2007 on private label uniforms for the Afghan Army without competitive bidding. If they were to simply use a desert camouflage pattern owned by the U.S. military and not being presently used, they could save $71 million over the next decade. 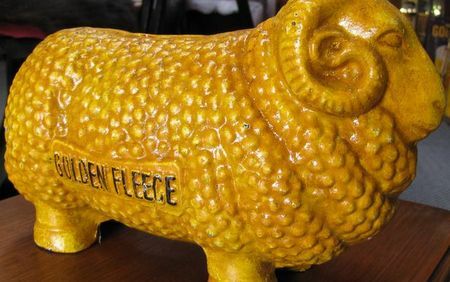 It makes one wish we still had a Senator William Proxmire, the originator of the Golden Fleece Award in 1975. He would issue the award in a monthly press release to illustrate how government agencies were being charged excessively or spending foolishly for goods and services. The Defense Department was often the recipient of the Golden Fleece. It's not easy to forget the $640 toilet seats they purchased that won the award. When the Inspector Generals' Office audited the Army last year they found trillions of dollars in accounting mistakes. They found missing receipts and invoices, 16,000 missing files, "unreliable data" and came to the conclusion that the finances of the Army could be "materially misstated." The Pentagon is legally mandated to be ready for a full audit by September 30 of this year. Legislation has been introduced to impose penalties if they are not ready. Since the Pentagon has never been audited before, and one study they buried last year showed $125 billion in unaccounted for spending, it will be a major undertaking to clarify where our tax money is really going. Especially when the bureaucracy at desks, over a million employees and contractors, is almost as large as those in the active military. And yet, there will be a bipartisan effort to endorse or provide more than the $50 billion increase the President is proposing for the Defense Department. Go figure! It's not just the wasted money! It's the absolute irrationality of the perpetual and pervasive acceptance of violence as the preferred option that has entered the psyche of our society and is sucking the life blood out of our democracy and economy. I watched with absolute horror our "success" in Mosul the other evening on PBS. The reporter is walking through the rubble with Iraqi military as they continue to make sure all the ISIS soldiers are eliminated and any potential sympathizers are taken into custody. They lead one person away, since no one else knows him. He's suspect! One wonders what happens to him outside the range of the camera. Others are digging through the rubble to find the bodies of family members. 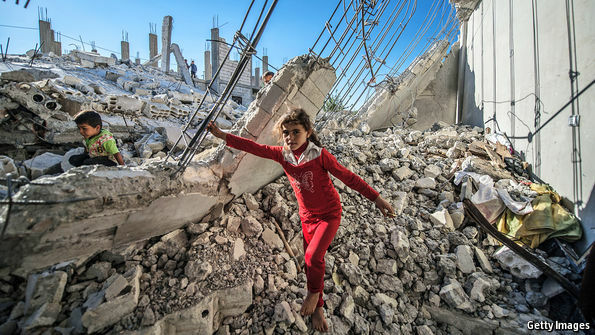 The death toll of civilians stands around 40,000. ISIS produced many but so did U.S. supported air strikes. One word describes much of Mosul today, rubble. It made me think of the Vietnam war days, when "we had to destroy the village to save it." I'm also thinking about Vietnam after an extended conversation with a Vietnam era vet this week. 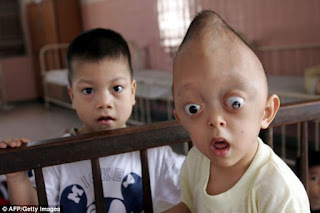 He was dropped into the jungles a few hours after they had been sprayed with agent orange. His physical disabilities have escalated over the years to the point where he can't describe the pain he feels. Call it full body! And don't watch the recent film on the after-effects of agent orange and other munitions on the people of Vietnam. That horror will invade your dreams. 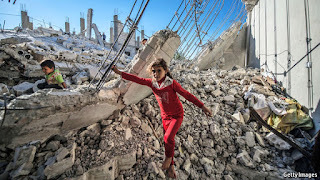 We measure military success these days in body counts and rubble, like Mosul, declaring "victory" here and there and so easily ignoring the aftermath. Let the decision makers dig the corpses of children out of the Mosul rubble. Let them serve in the institutions sheltering broken bodies in Vietnam. Have them sit down and talk with a vet willing to describe their past and continuing experience of hell. Maybe then they would recognize there are other ways to resolve international conflicts than always through violence and war. What ever happened to our State Department and diplomacy?